Please do not use our "Health Matters", website to attempt to diagnose or treat your pet. The consultation with your veterinarian is the best source of health advice for your individual pet. You should not rely, on the veterinary advice or any other information provided on this site for the diagnosis or treatment of any specific condition. You should always consult your own veterinarian for specific advice concerning the medical condition or general treatment of your pet. 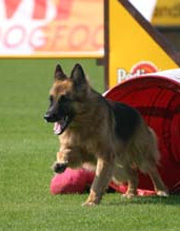 Günbil German shepherd dogs, worldclassgsd.com and or Günbil German shepherds, accepts no liability related to the veterinary advice and information provided on this site regarding health matters.